Hello everyone, its Ivett here! Hope you guys have enjoyed your week! It’s Friday and I want to share some crafty goodness with you!!! All throughout that year I’m always visiting antique stores, rummage sales, and other little tucked away stores in my area for vintage finds. 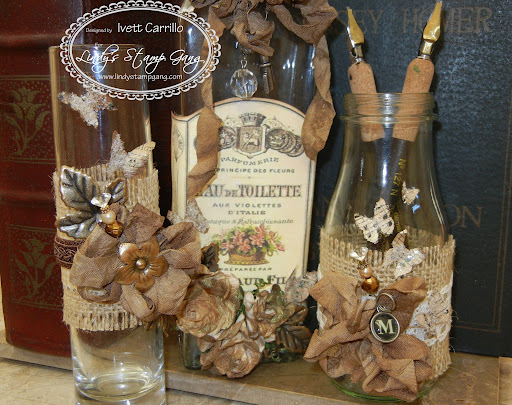 This week I want to share some altered bottle with you that I have gussied up with my favorite Lindy’s products. Enjoy the pictures and take a look at the video I created for you. Thanks for stopping by and I hope that I have inspired you to go and create some beautiful things! Just love decorated bottles like this. Wonderful tips & instructions. I will subscribe to your web channel TFS. 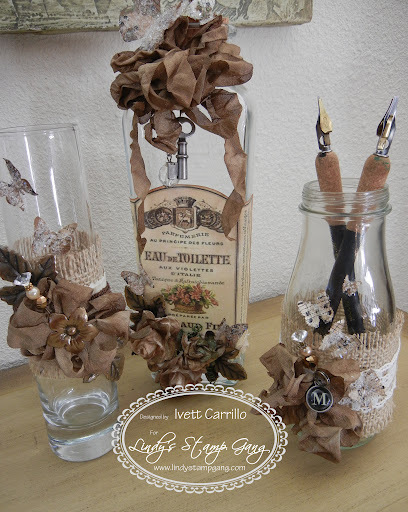 I love these bottles – I am making decorations for my son's fall wedding and these are inspiring me to decorate the bottles we are using for flowers. Can you do a video on how you made your bows? or send me somewhere to see one. Thanks so much!